Just as a well stocked pantry will help make cooking a breeze, there are certain kitchen techniques that will enhance one’s culinary experience. These techniques aren’t complicated, though they do take time to learn and master. So roll up your sleeves, load the YouTube video tutorials, and get ready to add these six essential techniques to your kitchen repertoire. There is undeniable appeal to a cut of meat or fish that has been perfectly seared. Seared proteins offer an enticing promise: well cooked on the inside and golden and crispy on the outside. The first step in searing a piece of meat or fish is to pat excess moisture from the food. Any moisture will create a flurry of bubbles as it reacts with the oil in your pan and will interfere with your ability to sear the entire surface evenly. Put a pan over high heat and warm the oil. Once the oil is ready to go, place your meat or fish in the pan and leave it be. One side is cooked when it lifts and flips easily from the pan. Sticking is your enemy and trying to turn the meat too soon may cause part of your new crispy surface to peel prematurely. Once your meat or fish has been seared, assess whether it needs to be put in the oven to fully cook. This may be the case with a juicy cut of steak, though many meats are fine with a simple stovetop searing. While canned beans may win in terms of convenience, nothing can beat the texture and cost of beans that have been fully prepared in your kitchen. This kitchen technique is all about giving yourself time. “Making” beans from scratch can be a time consuming process, with soaking and cooking times depending on your legume of choice. Once you have chosen your bean, there are four key steps that go into the cooking process: rinsing the beans, covering them with enough water so they don’t get leathery, adding any desired seasoning, and simmering the beans until they’re tender to the bite. From there, they can be further seasoned, tossed in a stew, or enjoyed in a salad. There are a number of cheats that can guide the cooking process. The Joy of Cooking debunks several myths on its website, including the misconception that beans take hours to make at home. Steaming is an important kitchen technique because it retains the nutrients in food, especially when it comes to vegetables. Where boiling strips a vegetable of its vitamins and natural chemicals, steaming maintains texture, taste, and health value. Vegetables aren’t the only food that can be steamed, and using this technique to prepare meat and fish is an alternative to having proteins sit and cook in oil. A steaming basket is necessary to get this kitchen technique right. Once you have that, boil a layer of water under the basket, not allowing the bubbles to enter the metal grating. Add the vegetables, fish, or meat and reduce heat to medium while the lid of the pot is on. You’ll soon have a steamed, nutritious dish. Roasted vegetables are the perfect accompaniment to many meals. Luckily, roasting vegetables is a straightforward technique, and there are four easy steps that can be taken to roast any vegetable. Those steps involve washing and cutting the vegetable, drizzling those evenly sized pieces with oil and sprinkling them with herbs, and roasting them on a parchment paper covered pan at around 425º F until they are cooked on the inside and have a crispy, golden exterior. 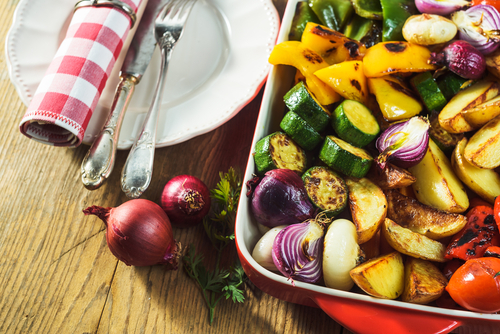 Roasted vegetables are best eaten directly after they’ve been prepared, as they will get soggy when set aside as leftovers or reheated in the microwave. There are many options when it comes to poaching. The technique involves cooking meat, fish, or vegetables in a liquid other than water. Think soup stock, wine, olive oil, and more. While it may look a lot like boiling, poaching involves cooking your food of choice on low heat and letting the flavors of whatever liquid you’ve chosen seep into the dish. The result will be succulent, tender meats and vegetables that have their natural flavors greatly enhanced. Poaching should be done in a wide pan in order for ingredients to be evenly distributed and cooked. Like a glorified slow cooker, pot roasting meats is a one dish meal. This is the perfect technique if you need to put dinner in the oven and go do something else. Like poaching, pot roasted meats are seasoned, soaked, and cooked in the liquids of your Dutch oven. Vice versa, the vegetables you add to a dish absorb the juices of the meat so you’re not losing any flavor. While a large Dutch oven is the best roasting vessel for meats, a cake pan or casserole dish will do just fine. Assemble your meat and other accompaniments snuggly in the pan, season with some salt, pepper, garlic, and other herbs, drizzle with oil, and you’re ready for the oven. Line whatever dish you’re using with parchment paper to make cleaning a breeze afterwards. Online cooking show The Scene has an excellent video tutorial demonstrating the basics of roasting and braising chicken thighs, and the flexibility that can go into your ingredient choice. The techniques above will add another dimension to your cooking. If you’re coming to the kitchen as a newbie, there are certain foods and tools you may want to consider stocking to make these techniques easier. Many of these techniques will also be simplified by being organized and mindful of simplifying your time in the kitchen. Happy testing! This entry was posted in News and tagged Cooking, Kitchen Techniques. Bookmark the permalink.